Home Tags Posts tagged with "Rio 2016"
London Olympics 2012 has hardly even had time to enjoy its success and already Rio is attempting to steal its shine, earlier this week releasing the official theme song for the 2016 Olympics. As can be expected, the new song and video showcase the typical laid-back, tropical style associated with the South American gem. The Gods of Olympus Visit Rio de Janeiro, as the song is called, was written by Brazilian composers Arlindo Cruz, Roge and Arlindo Neto, and was performed by well-known Rio de Janeiro natives. The song was released at the beginning of this week after Mayor Eduardo Paes, Governor Sergio Cabral, President of the Brazilian Olympic Committee Carlos Arthur Nuzma and several Brazilian athletes returned to the city with the Olympic flag. Brazilian carnival dancers invaded the stage in the final section of the closing ceremony last night to symbolize the handover from London 2012 to Rio 2016. It started with some samba street dance and ended with football legend Pele – London bid farewell to the Olympic Games with an unmistakable Brazilian twist. There were fears the stunning display would have to be toned down over concerns about the dancers’ revealing outfits. 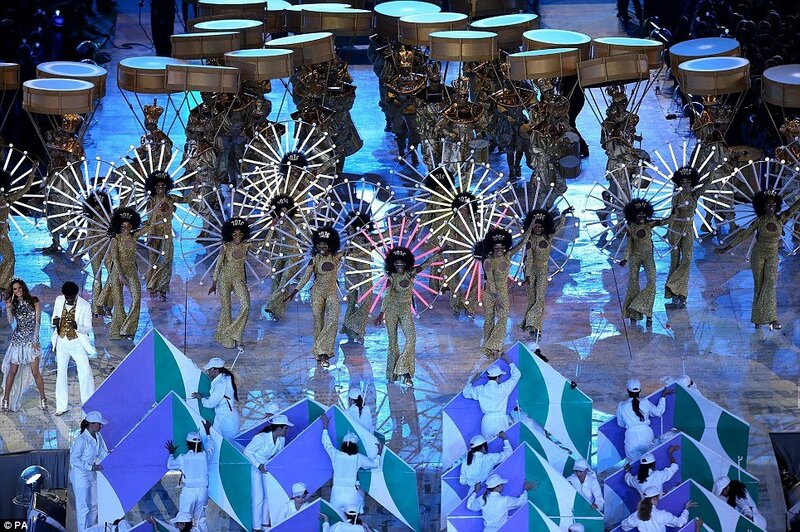 Officials were worried that the performers in the Rio carnival-themed section were too skimpily dressed. At one stage they asked the dancers to ‘tone down’ their outfits for fear they might offend the family audience. The Brazilian choreographers are thought to have protested, insisting the dancers’ outfits were an accurate portrayal of traditional carnival clothes. The colorful segment which closed the ceremony – featuring supermodel Allesandra Ambrosio and popstar Marisa Monte – was based on the Brazilian concept of the “Carioca” embrace. “Carioca” is the name given to a person from Rio, and the Carioca embrace- a traditional greeting in the city- was used to symbolize the warm welcome with which Rio wants to greet the rest of the world in 2016. The segment began with a street cleaner called Renato Sorriso – who became an internet hit after video of him performing an impromptu routine during a carnival in Brazil in 2009 was recorded and uploaded to youtube – practicing his samba steps. A security guard attempted to remove him, but was disarmed by a Carioca embrace of friendship. Moments later a colorful parade of dancers- representing the world famous annual Carnival held in the city – exploded onto the stage. And in a spectacular entrance, Brazilian pop singer Marisa Monte glided into the arena in a giant blue gown. Marisa Monte – who has sold 10 million albums worldwide and is considered one of the great figures of modern Brazilian music- was intended to represent the Brazilian sea goddess Yamanja, who is celebrated every year in a huge New Years’ Eve party on the beach of Copacabana. She performed a classical music piece with indigenous South American rhythms as well as the pop song “Maracatu Atomico” by Brazilian rapper BNegao. This was followed by the appearance of actor-singer Seu Jorge among an acrobatic performance by traditional Brazilian Capoeira fighters. Jorge- a Brazilian pop samba artist – was wearing a suit designed to represent the “malandros” – famous dandy characters of 1940s Lapa, a neighborhood in Rio de Janero. The procession of the fighters, interspersed with dancing couples, was intended to symbolize the movement of a lively Copacabana pavement. Among the couples was 31-year-old Brazilian supermodel Allesandra Ambrosio, most famous for modelling Victoria’s Secret lingerie. Her appearance will surprise few in Brazil as she had been tweeting about it all day and even posted pictures of herself arriving in the Olympic park by bus. The section ended as the entire cast united in a Carioca embrace in front of a vista of Rio’s unique skyline, while the Rio 2016 logo appeared on the stage. Rio 2016 will be the first ever Olympic games hosted by a South American country.